Earnings season is one of the most important times of the year on Wall Street. It actually takes up almost half of the year and creates excitement among traders and analysts. The excitement makes sense since this is one of the few times an analyst gets significant new information. Analysts create models they use to estimate what earnings for a company should be. The model requires inputs on sales, costs and the number of shares outstanding. These data points change frequently. Many companies know how the data changes daily. It’s obvious that sales and costs data would change daily. It also makes sense that companies would track this information closely. It might not be as obvious why the number of shares outstanding would change frequently. Companies add to and subtract from the number of shares outstanding on a regular basis. Shares are often used as compensation. Executives often receive grants of shares as part of their compensation. This is true at large and small companies. In many start up companies, share grants extend below the executive suites to many employees at all levels of the company. This can create millionaires in many companies and is responsible for much of the wealth in Silicon Valley. The number of shares outstanding can also be decreased by companies. This can be done with share buy back programs. Buy backs are now common and may be responsible for some of the market gains over the past few years. Companies can increase earnings by reducing share counts in some cases. These factors change frequently and analysts may not know how many shares are outstanding until the company updates them in an earnings report. It is logical that companies would not provide updates in real time. Telling the market when they plan to buy shares could increase their costs. The importance of earnings news is impossible to overstate. This is the biggest announcement most companies will make in a quarter and it is a comprehensive look at the company. Analysts will receive data that allows them to update information about sales, costs and shares outstanding. Those models are updated quickly, often in near real time. Analysts change their estimates, often before the market opens. This explains why price gaps occur when the market opens. Gaps are common throughout earnings season, which lasts about six weeks. There are four of these seasons a year and that results in 24 weeks of exciting markets. But, that leaves 28 weeks of the year when there are few earnings reports and traders cannot expect high volatility. To benefit from the 28 weeks that lie outside of earnings season, traders can concentrate on stocks where volatility is expected to decline. Options strategies can benefit from either an increase or a decrease in volatility. All traders need to do is identify whether volatility is high or low. Professional traders can use indicators like implied volatility to find potential trade candidates. Volatility is important to options traders because volatility is the most important factor in determining an option’s price. Unfortunately, individual investors may not have access to this information. They may be able to find implied volatility in real time but they may not have access to information about the trend of implied volatility. Fortunately, there are other indicators that individual investors can use to assess the trend in a stock’s volatility. Bollinger BandWidth could be one indicator to spot the trend in volatility. The average true range (ATR) is another. The ATR is relatively complex to calculate. It can be done but there is no need to. The indicator can be found at many web sites for free, including StockCharts.com and TradingView.com. Rather than detailing the calculation, we will provide an example of what you can look for. The chart of United States Steel Corporation (NYSE: X) is shown below. The ATR is shown below. The default value for the calculation is usually 14 periods and that is what is used in the chart. You can see that ATR has been rising. Volatility, as measured by the ATR, has been rising since earnings were announced. This announcement was also met with a price gap, which was quickly reversed. The ATR, a measure of volatility, has increased 50% since that announcement. 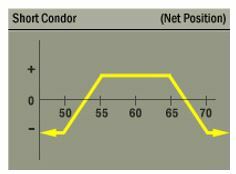 An iron condor is a strategy that traders should consider when volatility jumps if they expect volatility to return to lower levels. It is a directionally neutral strategy that derives its profits from a stock’s trading in a relatively narrow range until options expire. A trading range is associated with declining volatility. An iron condor will consist of four individual options contracts. To open the position, a trader will sell one call while buying another call with a higher exercise price while selling one put and buying another put with a lower exercise price. The exercise prices of the calls will be above the stock’s current price. The exercise prices of the put options will be below the current price of the underlying stock. The difference between the exercise prices of the calls will be the same as the difference between the exercise prices of the puts. And all four contracts will expire on the same day. The risks are determined when the trade is opened. These transactions will result in a credit to your account. The maximum loss will be equal to the difference between the option exercise prices and the premium received when the trade was opened. The maximum gain will be equal to the premium received. The potential gains and maximum risk are summarized in the diagram below. The amount of capital required to open the trade will generally be equal to the amount of money risked. That makes the possible gain a high percentage of the amount risked. An example will clarify this. These are all options that expire on September 8. Each contract covers 100 shares so buying the $20 put will cost $23. The total income generated from the two sell transactions if $73. The two buys cost $40 resulting in a credit of $33. The risk is equal to the difference in the exercise of the puts (or calls since the two are equal) less the premium received. This is $100 minus $33 or $67. The possible return of $33 on $67 of trading capital is a potential return on capital of 49%, a relatively large return on investment for a trade that will be open for less than four weeks. This trade shows the benefits of condor trades. They require just a small amount of trading capital and result in immediate income. The potential returns, in percentage terms, are quite large and the time frame to earn those returns is relatively short. This could be an ideal strategy for investors with small amounts of capital seeking to benefit from a market that may not move much until the next earnings season starts in October.